Ujjain is primarily a spiritual destination in India. However, architectural monuments and observatory are interest to tourist. 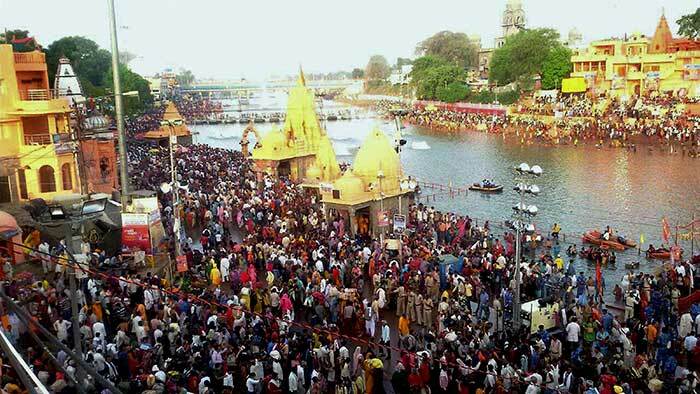 Situated on the eastern bank of the Kshipra River, Ujjain is amongst the seven sacred cities for Hindu pilgrimage. The famous Kumbh Mela held every 12 years commences here. It has been the Prime Meridian for Indian geographers since 4th century B.C. Other points of interest include observatory, palace, caves and art gallery. With the advent of the Aryan settlers, Ujjain acquired eminence. The first historical evidence of the city, mentioned in the Buddhist literature in 6th century B.C. defines the city amongst the four great powers including Vatsa, Kosala and Magadha. In 8th century A.D it became the center of Sanskrit learning. Captured by Mughals in 1235, several temples were destroyed. However, it was not until 1750 when it became part of Gwalior under Akbar’s reign, was Ujjain restored to Hindu control. It was a home to many Indian historical figures like Ashoka and Chandragupta II. Kaliadasa in his poem Meghdoot conjures up a vivid image of a civilized society with deep philosophical and religious outlook yet intensely practical and leisurely. Today, Ujjain is a modern town with textile and agricultural market, and home to prestigious Vikram University. What does tour to Ujjain offer? Tourists seeking a spiritual revival should visit the most sought after temple of Mahakaleshwar. Other famous temples include Chintaman Ganesh temple, Dakshin Mukhi temple, and Harsidhhi Durga temple and shani temple of Triveni. The recently built ISKCON temple is a huge crowd-puller, while Sai Baba ashram and Prashanti Dham offers spiritual healing. Tourists who are bewitched with the concept of black magic can visit the Kaal Bhairav temple, known for tantric worship. Are there archeological structures or palaces and gardens to visit? Kaliyadeh Palace reflects the exquisite Persian architecture through its dome. Durgadas Ki Chhatri, a shrine built on the funeral site of the famous Rajput warrior Durgadas. Visit the ancient caves of Bhartrihari Gufa, the mediating and resting place of the famous King Vikramaditya brother. Tourists who are inspired by the Indian astronomy should pay a visit to the Vedha Shala Observatory renowned for its state-of-the-art astronomy instruments like Samrata Yantra. Maharaja Jai Singh built the observatory in the 1700s. Every travel itinerary has space for shopping! Ujjain is renowned for handicrafts. Shopaholics can visit the local bazaar and splurge on tribal jewellery, papier-mâché items, tribal metal wares, lacquer ware, bamboo items, exquisite beadwork and pottery. Jawahar Marg, Mahakaleshwar Marg and Gopal Mandir Marg are the recommended shopping areas. For more modern shops and restaurants, you should head towards Free Ganj. Other popular tourist destination for a weekend visit is Sailana. A former princely state located 130 km away from Ujjain houses over 1200 species of cactus, 13sq km bird sanctuary and two Kedareshwar temples. Tour to Ujjain has burned your calories and your stomach growls for food. The big question plagues your brains -Where to eat? Most hotels and restaurants offer decent vegetarian meals including traditional snacks. Bite in Bhutta Rikees made from grated corn roasted in ghee and cooked in milk. Baati, traditional bread, dipped in ghee and consumed with pulses. If seeking fast food head towards clock tower without a flinch. Climate: Tropical Monsoon. Summer Temp: 42°C Max 20°C Min, Winter Temp: 28°C Max 10°C Min.